Charles White played for the University of Southern California. In 1978, White won the W.J. Voit Memorial Trophy the outstanding college football player on the Pacific Coast. In 1979, he received the Heisman Trophy, Maxwell Award, Walter Camp Award, and was named UPI Player of the Year. 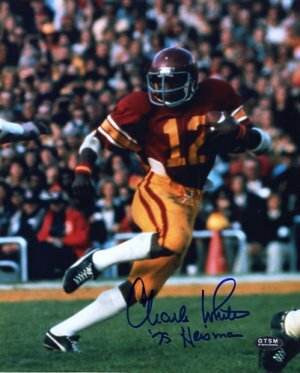 Charles White has hand autographed this USC Trojans Color 8x10 Photo with 79 Heisman Inscription. Charles White Hologram and Certificate of Authenticity from Athlon Sports.